NuSphere PhpDock - unique php deployment solution. Major features. Deployment of any PHP web application as a Stand Alone Windows Desktop application w/o any changes in the code is supported in the features of PhpDock. 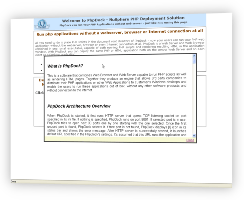 PhpDock combines NuSphere's powerful embedded Srv web server and browser components. These features give the PHP Developers the full control over PHP Applications behavior. All of the major features listed below are explained Configuring PHP Applications and Running PHP Applications with PhpDock. Support for Different Mime types. PhpDock supports about approx 140 file extensions and their mime types. Learn more about these and other features in Configuring PHP Applications. 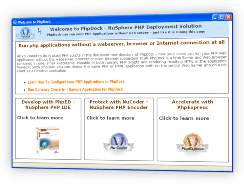 Download PhpDock and other NuSphere PHP Tools for FREE Trial.